Provenance: Purchased from Yamanaka & Co, Beijing, 1918. Notes: These spectacular and rare imperial panels bear decoration which is full of auspicious elusion, in keeping with the message provided by the large vermilion characters, which dominate the design. These characters, reading ning xi, may be translated as 'gathering joy', and suggest that the panels may have been presented on the occasion of some specific celebration - probably a birthday. 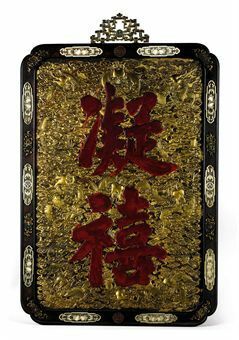 At the centre top and bottom of the zitan wood frames are circular shou, 'longevity' characters in gilt and paste ruby gems. A similar circular shou character forms part of the elaborate hanging device. In addition, of the beautifully carved and exceptionally delicate ivory plaques, which are placed at intervals around the frame, the two plaques mid-way down the sides of the fames bear circular shou characters flanked by bats. The bats symbolise happiness, while the fact that one bat on each ivory plaque appears upside down provides a rebus for 'happiness has arrived'. The other ivory plaques depict auspicious fruit and butterflies. The butterflies provide a rebus, which doubles the auspicious wish indicated by the fruit. Alternating with the ivory plaques on the frame are the Eight Buddhist Emblems depicted in gilt and colourful paste gems. The fluttering ribbons tied to each of these emblems are particularly finely wrought. The use of these paste gems on a piece of such high quality suggests that these plaques may have come to the court as part of imperial tribute from Guangdong. Such paste gems are frequently seen on clocks made in Guangdong as imperial tribute. 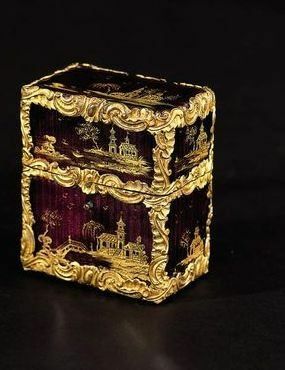 In addition, there were Guangdong craftsmen who specialised in very fine zitan carving, as seen on the frames of the current plaques, while others specialised in fine gilded metalwork, as seen on the repoussé plaques themselves. It is significant that the lively and beautifully rendered dragons amongst clouds seen on the current plaques bear a strong resemblance to those seen on a large zitan cupboard, which was sent to the palace as tribute from Guangdong, and which can still be seen in the Western chamber of the Yangxindian in the Beijing Palace (see Tributes from Guangdong to the Qing Court, Hong Kong, 1987, p. 39, fig. 14). The archaistic, formalised, dragon design of the elaborate gilt hanging device at the top of the frames is typical of the later Qianlong reign, while the impressive five-clawed dragon in the upper register of each plaque, dominating the four-clawed dragons in the clouds below him, would have been intended to represent the emperor himself. 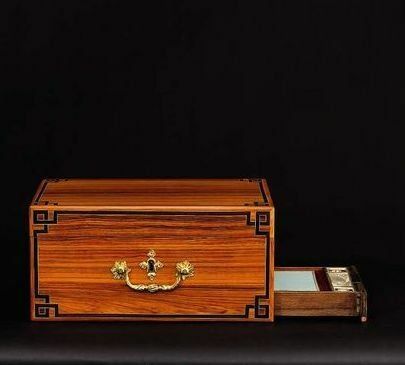 A rare most likely imperial rock crystal and gilt-bronze and silver kapala on stand and cover, tibeto-chinese, qianlong period. A finely carved imperial lapis lazuli hawk. qing dynasty, qianlong period. An inscribed imperial jade boulder. qing dynasty, qianlong period.